Labour’s result in the Inverclyde by-election (30 June 2011) was an impressive electoral performance, particularly coming so soon after Scottish Labour’s humiliation at the hands of the SNP in the Scottish Parliament elections in May. The principal Scottish Parliament constituency in the area, Greenock & Inverclyde, saw Labour squeak to a 511-vote majority over the SNP in the election in May, while the SNP won the other local constituency (Renfrewshire North and West). The result in the area covered by the Inverclyde Westminster seat was probably nearly a tie between Labour and SNP. For Labour to win by 5,838 votes (20.8 per cent) in June marks a considerable recovery. Many observers, myself included, had expected a much closer result than this or perhaps an SNP victory, and Labour had been pessimistic during the campaign. This was as much because of the historical pattern than the timing of the by-election in the afterglow of the SNP’s sweeping Holyrood victory. By-elections in working class, hitherto ‘safe’ Labour seats in Scotland tend to become straight contests between Labour and the SNP, and the SNP enjoys a large swing. This has happened almost regardless of the political climate. 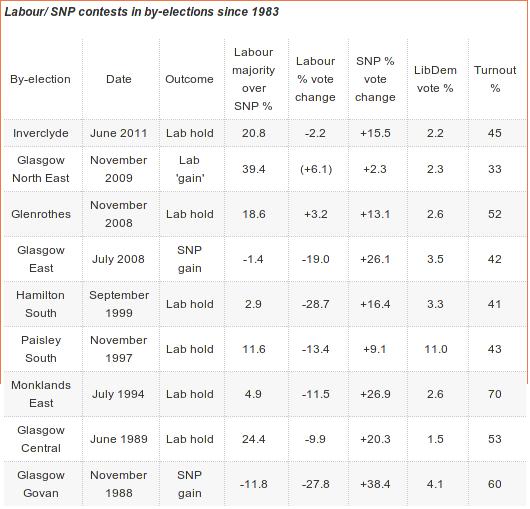 Some huge swings have happened despite Labour generally riding high at the time (Monklands East, Hamilton South), as well as at low ebbs (Glasgow East). The very biggest in the last 30 years, Glasgow Govan in 1988, came when Labour was in a disheartened and divided condition a year after it did well in Scotland despite losing the election nationally. Inverclyde therefore should be particularly pleasing for Labour and Ed Miliband. The Liberal Democrat vote in Inverclyde was humiliatingly low, but it was part of the general pattern of collapse where an election becomes a two-way contest between Labour and the SNP. With the exception of Paisley South in 1997 (and even more Dunfermline & West Fife in 2006 when the Lib Dems started a clear second to Labour), the party loses its deposit in these circumstances. Inverclyde is worse than most of them for the party because it is the only place where the Lib Dems had much of a presence beforehand. They controlled the local authority before 2007, and Greenock was a very rare place with a working-class Liberal history. They ran Labour fairly close in 1970, despite Menzies Campbell withdrawing as candidate because the election clashed with his wedding. In 1983 a Liberal candidate (A.J. Blair) also polled well, with over 36 per cent of the vote. Inverclyde illustrates two facts about Scottish voters. They favour left-of-centre government, and they are pragmatic and intelligent about how they achieve it. Apparently enormous electoral changes like Labour’s victory in 2010 and the SNP landslide in 2011 are reflections of these basic attitudes, and Inverclyde confirms that Scots’ voting choices are very dependent on the context. The Westminster village seems to have decided that Labour is doing badly in opposition, but voters in Inverclyde clearly do not think so – if they did, they would have delivered a shock to the system like the voters of Govan did in 1988. Labour, in Scotland and in Westminster, can take a great deal of comfort from the result – but would be foolish to conclude from it that the voters are having second thoughts about their emphatic support for the SNP’s Scottish government.